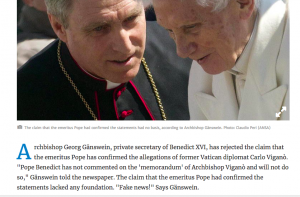 Secret footage revealed of Georg Ganswein attempting to pick a fight with Ed Pentin – What's Up With Francis-Church? When are these idiots going to understand that you just don’t mess with Ed Pentin? 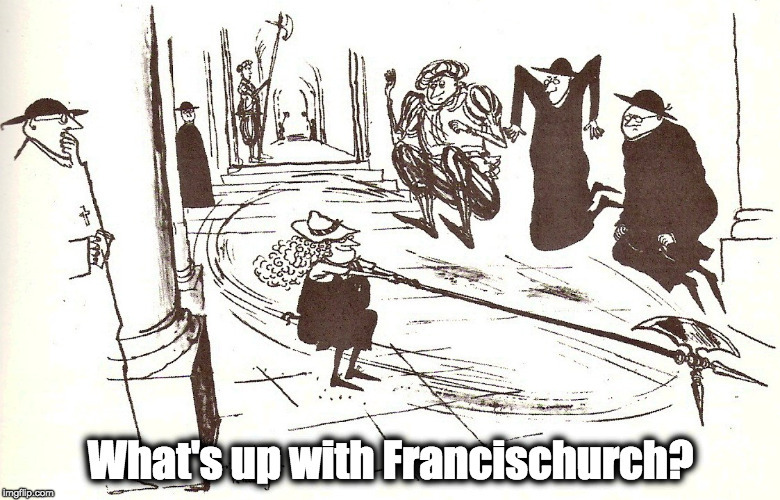 Does no one remember the audio recording of Kasper insulting the African bishops? Helloooo? 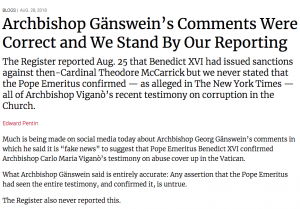 He also said Benedict had “no opinion” on the memorandum of Archbishop Viganò. 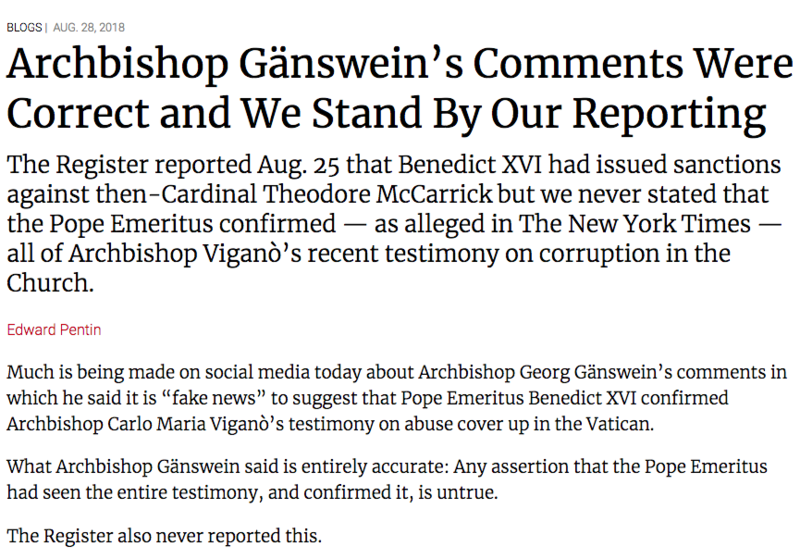 It is not clear what memorandum he is referring to, as a number of memoranda are mentioned in Archbishop Viganò’s testimony, and Archbishop Viganò never refers to Benedict’s penal measures on McCarrick as a “memorandum.” Archbishop Gänswein did not go into any more details, but he did not refute that Benedict issued sanctions. The Register fully stands by its reporting, drawn on sources close to the Pope Emeritus, that sanctions were issued by Benedict against McCarrick. 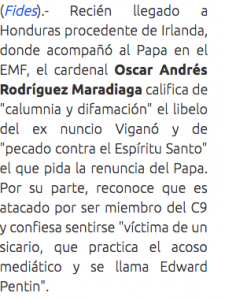 Oscar Andrés Rodríguez Maradiaga described as “slander and defamation” the libel of former nuncio Viganó and “sin against the Holy Spirit” that asks for the resignation of the Pope. 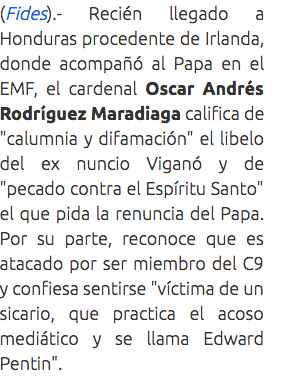 For his part, he admits that he is attacked for being a member of C9 and confesses to feeling “the victim of a hitman, who practices media harassment and is called Edward Pentin”. Yeah, this one’s a real animal. When you lean into his microphone and viciously slander someone, and then deny having said it and accuse him of lying, and then call your personal bullyboys to get him fired, he puts the recording that you knew he was making on the innernet for all the world to see what a lying – and very stupid – SOB you really are.